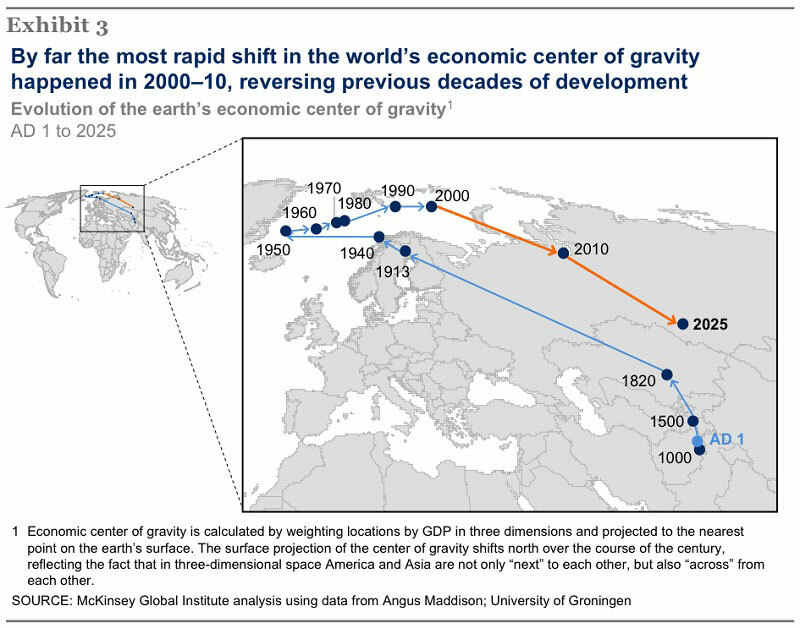 A remarkable visual from the equally remarkable “40 Maps…” demonstrates the shift of economic power and wealth eastward, a trend that began in 1950 reversing 2000 years of movement to the west. While the time scale is not equal, with the first 1000 years occupying the same amount of X-axis space as the most recent 8 years of history, this one chart conveys a remarkable amount of information. What mostly astonished me was that global economic output until 1700 was dominated totally by two nations, China and India. If the time scale were treated equally, the era of the rise of the US (green area beginning in 1700) would occupy only a small sliver of the right hand end of the chart. Historically, China’s reserves have been managed very conservatively with the bulk invested in US Treasury securities … and other highly-rated debt. Now that is changing. The Chinese government “thinks there is no sense in putting money in Treasuries or European government bonds, and financing western deficits” says one former Hong Kong financial official. We are going from made in China to bought by China. 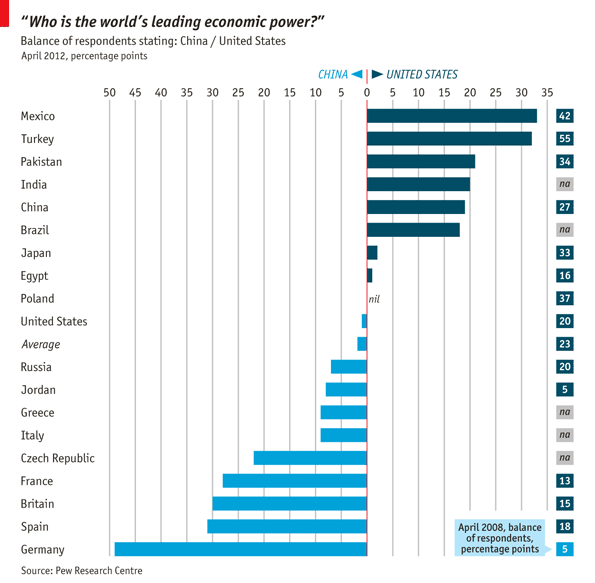 UPDATE: Barry Ritholz points to this from the Economist, claiming that a majority of the world’s nations already believe that China is the most important economy in the world. Perception, while perhaps not everything, plays a critical role in decision-making, for nations as well as individuals. Wealth accumulation in today’s China in this YouTube video. Aside from the striking ostentation of their great new wealth, what strikes me most forcefully was the abundant ambition amongst the business entrepreneurs. In a March 3 post, I discussed in some detail a This American Life podcast entitled “Mr. Daisey Goes to the Apple Factory.” This podcast, criticizing what were presented as widespread worker abuses at Apple manufacturing plans in China, has been withdrawn for what appears to be serious factual errors. My March 3 blog post has been taken down. This American Life posts a retraction of the original story here. 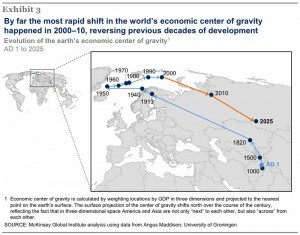 China investment like 19th century US railroads? I read four entire books during my August getaway. Perhaps the most interesting was Country Driving, the story of one journalist’s exploration of today’s China. Chapter Three – “The Factory” – tracks the genesis and growth of a brand new development zone – from rural to urban in five years. It is a view I don’t think many Americans have of this country that is expected to build more than 100 new cities of at least 500K population in the next 10 years. I can also say that I found Barnes and Noble’s Nook an excellent substitute for reading print books while on vacation. A Chinese tycoon plans to buy a vast tract of Icelandic land for a $100m tourism project which critics fear could give Beijing a strategic foothold in the North Atlantic. Huang Nubo, a real estate investor and former Chinese government official, has struck a provisional deal to acquire 300 square kilometres of wilderness in north-east Iceland where he plans to build an eco-tourism resort and golf course. Opponents have questioned why such a large amount of land – equal to about 0.3 per cent of Iceland’s total area – is needed to build a hotel. They warned that the project could provide cover for China’s geopolitical interests in the Atlantic island nation and Nato member.